A home is far more than just an immovable asset. It’s your dream. It’s your shelter. Most importantly, making a home is one of the biggest decisions of your life with no room for compromise with anything. Right from experienced and reputed architects, knowledgeable constructions workers to the brand and quality of materials used everything should be scrutinized carefully. 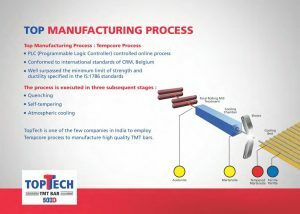 TEMPcore Process – TMT bars are manufactured via different processes. Out of all the processes, ‘TEMPcore Process’ yields the most advanced and high quality TMT bars. Also, it saves around 17% of steel in comparison to ordinary TMT bars and it’s cost-effective too. So, you should look for supplier who sells TEMPcore made TMT bars. 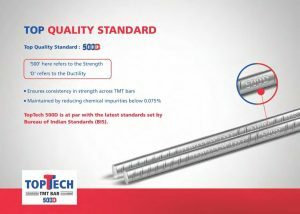 TMT bars’ Grade – With most of the reputed suppliers TMT bars are available in different grades. Look for the one that offer top quality standard, i.e. 500 D (here 500 means strength and D means ductility). If you want your home to stand tall regardless of the adversities of the nature, going for a high grade product is a must. Therefore, before finalizing the deal with a TMR bar supplier, do make sure to check it out. Integrated Facilities – Ladle refining furnace (LRF), Induction furnace and Continuous Casting Billet Machine (CCBM), these are some of the top facilities that are leveraged to product high quality products. Make sure to look for these. Certifications – It is very important. When you buy a product for example a home appliance, you look for ISI mark. That’s because it’s a sign of quality and trust. 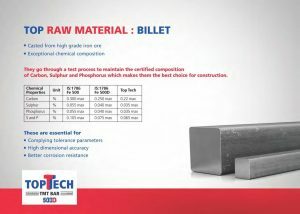 Similarly, before selecting a TMT bar supplier in West Bengal, you should check out the certifications and other important credentials it holds. As far as construction materials are concerned, ISO certification and ISI mark are really crucial. Transparency – Undoubtedly, whichever supplier you come across would always claim to be the best in the market. However, it might not be the actual thing. Therefore, you should go for a company that offers transparency about its products, processes, projects, credentials and other relevant aspects. 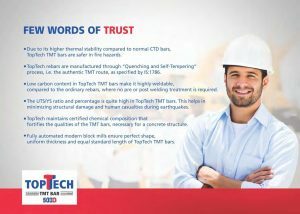 These are 5 of the most important things to consider when selecting a TMT bar supplier in West Bengal. Your home is your pride. Nurture it so that it nurtures you for the lifetime. 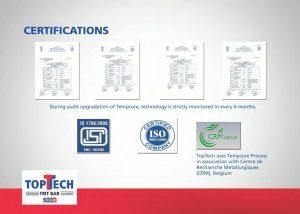 Visit https://toptechtmt.com/best-tmt-bar/ for more details.